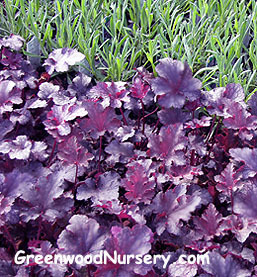 Heuchera Plum Pudding is considered one of the most popular Coral Bells. With its brilliant purple foliage, the Plum Pudding Heuchera will quickly become your gardening favorite. This evergreen perennial is worth growing just for its evergreen foliage alone. The Heuchera Plum Pudding Coral Bells is striking addition to any landscape setting. Heuchera (pronounced Hue kah rah with emphasis on Hue) is a species native to the U.S. and commonly referred to as Coral Bells. You’ve probably seen it in your parents or grandparents gardens. They are semi-evergreen to evergreen perennial plants (depending on your location) and provide such a great impact of color and texture in the landscape making them great investment plants. There are lots of great hybrids which will grow in many different situations from full sun to full shade. Each variety will have its own requirements, so be sure to read them carefully. Most Heucheras are cold hardy to zone 4 and heat hardy to zone 9 and considered to be deer resistant. Over June and July, they shoot out spikes with tiny bell shaped flowers whose colors will vary according to the variety. Coral Bells grow best in soil that has been amended with organic matter (aged compost mix and/or aged manure mix) in an area that is moist, but not wet. Once planted, they are virtually maintenance free, although you may want to dig them up, divide the crowns and replant them about every 3 to 4 years. This plant species is found to grow under walnut trees. For areas in your garden or landscape where you want to keep plants low (under 3 feet), this is the perfect plant. Select several different hybrids for variations in size and color. Wonderful companion plants for the Heucheras are other Heucheras, ferns, hostas and ornamental grasses. The white flowers are dazzling on the dark plum stems, although I remove the stems and use for cut flowers, as I consider the flowers of heucheras detract from the beauty of the plant. This Heuchera variety is more compact than most heucheras. It is excellent for use around trees, shrubs or as border plants. Commonly known as Coral Bells, Heucheras are proven in the garden as tough, long-lasting plants requiring very little maintenance. Garden Care: Part shade to full sun, Light, fertile, moist but well-drained soil. Side dress with compost or manure in fall. Fertilize in spring. Divide Huechera Plum Pudding plants in autumn.